Frequently Asked Questions (FAQs) on NYSC’s Online Registration ( N4,000 Controversy ) - Corpr! Prospective corps members and other critical stakeholders have been asking certain important questions and seeking clarifications on the online registration initiative recently introduced by the NYSC. 1) Why are Nigerian youths being asked to pay to serve their country? It is not true that corps members are being asked to pay to serve their country. Far from it. The NYSC and the government appreciate the enormous sacrifice that corps members have made, and continue to make, for the unity and the development of this country. The Scheme will continue to explore ways to ensure that corps members serve the nation in safety and with ease. This latest initiative was conceived in that spirit. Based on feedbacks and requests from past corps members, the initiative was designed to lessen the costs and risks associated with corps members travelling to their schools to pick up call-up letters. It should be remembered that prospective corps members become the responsibility of NYSC when they show up in orientation camps, not before. 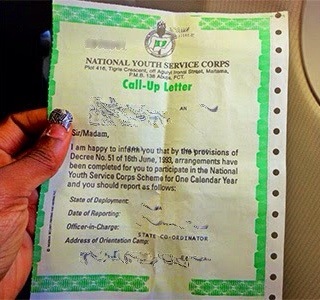 So, prospective corps members (not NYSC) have always borne the costs of travelling to get their call-up letters. This has not changed and no extra burden has been imposed on our prospective corps members. While those who want to physically pick up their call-up letters from their schools are still allowed to do so, this initiative has created an extra option for those who wish to access their call-up letters online. It has empowered prospective corps members to make their choice, based on their situations, preferences and assessments of the opportunity costs involved. Paying N4000 to process call-up letters online is a choice for those who prefer that option. It is not a condition for national service. So, no one is being asked to pay to serve, as those who do not pay will also undertake their national service without any form of discrimination or sanction. Paying N4000 to process call-up letters online is a choice for those who prefer that option. It is not a condition for national service. 2) Why are corps members being forced to pay for their call-up letters? 3) Why ask prospective corps members to pay N4000 just to print call-up letters? The N4000 is not just for printing call-up letters. It is for the entire package of online registration, which requires the deployment of IT hardware and software and personnel to orientation camps all over the country but which also gives those who subscribe to it the advantage of processing their registration online, saving time during registration at the orientation camps and allowing them to use their thumbprints to identify themselves in case they lose or are dispossessed of their call-up letters. In the past, corps members who lose or are dispossessed of their call-up letters had to go through a cumbersome process of swearing affidavits, getting validation from their schools which takes time and may force them to enlist on another batch. With online registration, those who are unfortunate to lose their letters can identify themselves with their fingerprints. So the N4000 fee is for the entire process and package of benefits. 4) Is the initiative not extortionist and insensitive? As explained above, the initiative was designed with all sense of fairness and sensitivity. It is not extortionist, as extortion implies the use of open or subtle threat. No open or subtle threat is involved here. It is not compulsory and non-use of it carries no sanction. It is only for those who choose to exercise the option after doing their own cost-benefit analysis. NYSC is sensitive to the fact that not everyone needs or can afford this. Both those who need and can afford it and those who don’t need it or can’t afford it are given options to choose from. The initiative is thus both fair and sensitive. 5) Why not maintain the status quo? Contrary to claims, the status quo remains. NYSC has not abolished the practice of prospective corps members going to their schools to pick call-up letters. That is still allowed. What has happened is that an extra option has been introduced, which prospective corps members may choose or may not choose to exercise. Closing this new option will not necessarily be at zero cost to those who prefer the status quo, as prospective corps members have always been responsible for picking their call-up letters. But closing the option will be at the expense of those who will prefer it as this will rob them of their right to choose. 6) If this is so desirable, why can’t government fund the initiative? 7) Why can’t the ICT department of NYSC handle this? 8) Will those who refuse to pay not be victimized? 9) Is it open to foreign-educated corps members? Yes, it is open to them too and for the same amount. The usual practice was for prospective corps members educated outside the country to come to NYSC Headquarters in Abuja to process their call-up letters. Now they can stay wherever they are based and process their call-up letters online, if they choose to exercise that option. Also, from Batch A next year, prospective corps members educated outside the country do not need to come to Abuja for the verification of their certificates. Their uploaded certificates will be verified at the orientation camps in the state where they are deployed.